You don’t want to miss out on ABC’s Super Beach Resort! 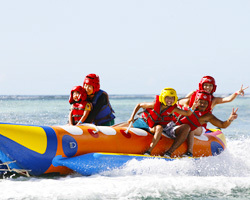 This awesome beach resort package includes 16 different kinds of resort activities. But wait, there is more! Be prepared for ABC’s all-you-can-eat lunch buffet which is included FREE with the purchase of any ABC package. ABC’s Super Beach Resort includes snorkeling, our unique 3-wheel water tricycles, pedal boats, kayaking, Instant Tatoos, stone art painting, costume demonstration, coconut demonstration and much more. ABC is also proud to introduce FREE all you can enjoy SUP: Stand Up Paddle Boarding! You can eat lunch at anytime between 10:45am and 3:30pm, as many times as you want! Also, ABC provides FREE use of our beach umbrellas, beach chairs, beach shoes, lockers, and complimentary drinking water, all at ABC’s main facility! Our unique and exclusive snorkeling area, which is exclusively reserved for ABC customers will ensure an enjoyable experience for all guests. Please participate in any and all beach activities, and be sure to satisfy the hunger that will build up with our World-Famous Fried Chicken Recipe! When it’s good, it’s famous☆. Stand Up Paddlboarding has become one of the biggest trends. Now, everyone can enjoy it with any package at ABC. At ABC, you can enjoy snorkeling for FREE which is usually a tour by itself at any other facility. Not at ABC, its included FREE! We have a small costume presentation along with unique items for taking pictures! All of this can be found beachside at our main facility. Don’t forget to use our Pedal Boats which are available on the beach. Multicolored floats are available on the beach for your enjoyment when you want to Relax. Our exclusive snorkeling area is 500m long and in shallow water. You can reach the snorkeling course by simply walking or taking a water tricycle! Please feel free to spend your whole day at the beach with these activities. Please use all of our equipment, and in the rare case that there is not enough you can always ask one of our friendly staff members for more! From 10:45am to 3:30pm ourunlimited lunch buffet will be open. Practice your art skills with our Stone Art Painting. You can bring back your masterpiece as a memento from ABC! Our coconut demonstrations happen at 11 am and 1 pm. ABC also offers select Instant Tattoos free of charge. Belongings If you plan on getting in the water, please bring a swimsuit and a towel. Lunch You can enjoy the all-you-can-eat buffet from 10:45am-3:30pm. 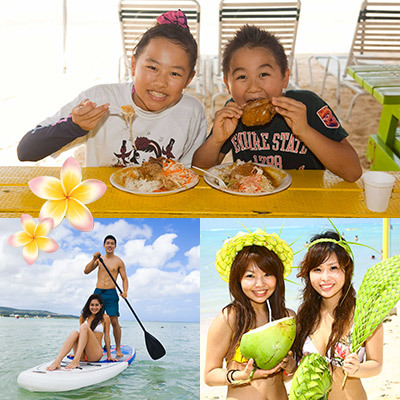 Included in price Pick-up service, lunch, use of facilities and all kinds of mini activities. Notes Pregnant women can participate in this and only this package. These who are under the influence of drugs or alcohol, or those who have physical ailments cannot participate. Alcohol is not permitted. For the person who does not want to participate in the Marine Sports activities, you can always join our Super Beach Resort. It is a resort set with all-you-can-eat buffet and mini beach activities all day. When you arrive at ABC, a briefing is performed for all of our guests. There is an explanation about each activity and the procedures and guidelines that we will ask you to follow. After your briefing, you will be provided a wristband. Secure your belongings in one of our complimentary locker, please be sure to check if your locker is properly secured! Beach shoes are available at ABC’s beachside facility. ABC strongly suggests using the complimentary beach shoes to protect your feet from the coral, and also to protect Guam’s sea life. A beach umbrella, a beach chair and beach shoes are also included in Super Beach Resort. Please use them. A return bus departs to your hotel every hour from 12:30pm to 4:30pm (for Leo palace resort, only at 4:30pm). Please gather on the second floor deck area, located just outside of ABC’s gift shop, 10 minutes before the departure time. You can visit ABC wearing only your swimsuit, but if you do need to change clothes we have a locker room for you to use. The locker room is located just inside the Gift Shop. You don’t need much to enjoy yourself at ABC! We recommend you bring the following: a towel, a camera, sunglasses and a cellular phone. Free Wifi is offered at ABC’s Beach Resort. Think minimal, you probably won’t want to bring a big bag. Can I add packages on the day of the tour? YES! It depends on the availability of certain activities on your tour day. We encourage you to do ALL of the activities. Please come to the Reservation Center inside the Gift Shop to find out more. Do I need to pre-book for the Exclusive Snorkeling course? Making a reservation isn’t necessary. It starts at the top of the hour every hour from 10:00am to 3:00pm, so please come to the snorkeling briefing area 5 minutes prior to the start time. At ABC, we have got the food to fuel you after all of these fun activities. We offer salad for starters, a really tasty golden curry with rice, pancit which is a stir fry of noodles with vegetables, and last but certainly not least, our World Famous Fried Chicken. You can eat as many times as you’d like between the hours of 10:45am to 3:30pm.